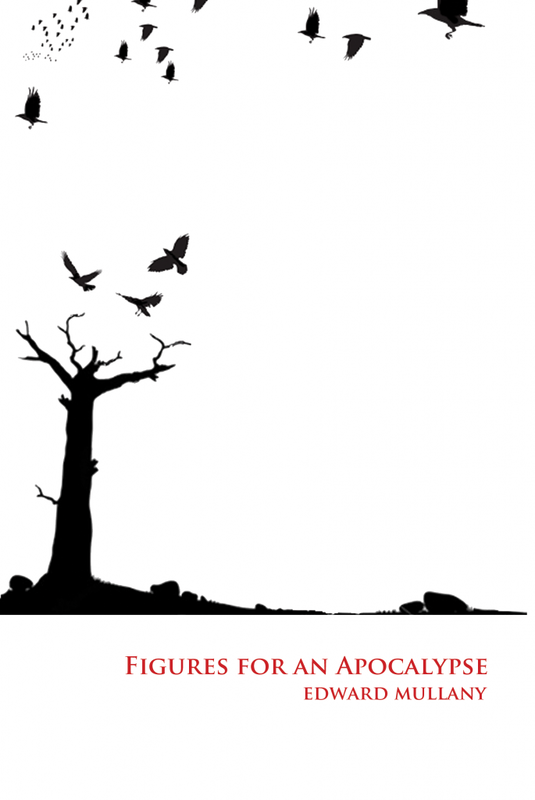 From the author of If I Falter at the Gallows, Edward Mullany, comes a longer volume of work titled Figures for an Apocalypse, a title he has repurposed from a short 1948 manuscript from Thomas Merton. The hypothetical of his first collection’s title seems to haunt this second—“figures for” indicate a sort of preparation in case of, giving a reader the sense that this apocalypse is looming, on its way, but hasn’t exactly arrived. Figures for an Apocalypse (Publishing Genius Press, 2013) is divided into three sections, each referred to as “books”. This division may seem first to imply narrative or a separation of ideas, but while the three books’ themes and styles overlap, there is no plot arc like, say, a novel in verse might have. The three “books” allow the reader to breathe between the pieces that are difficult to stop reading one after the other. A collection this long (180 pages) of poetry not separated into sections could be intimidating to the average reader of poetry. Something distinct within the entire volume, however, are the various styles of writing Mullany uses. He writes in prose, poetry, and then also prose poems. The prose pieces read like realistic little fictions, the prose poetry are more abstract, and the poems, ultimately, serve to help the reader truly see and feel the pending (or, in some poems, arrived) apocalypse. There are prose fictions that are mostly familiar, seeming like episodes that could happen today. “The Teething” (29) in Book One gives us a woman awake in the middle of the night, listening to a baby crying and trying to determine whether or not her husband will go to the baby. This is a scenario mothers could relate to, and also one that introduces a repeated notion in Mullany’s work: a distinct use of the word “or”. In Book Two, the poem “Say No” (92), another familiar reality, a narrator punches his mother’s former fiancé during a party that the fiancé is throwing. He then hides in the bushes to hear what his mother has to say to the fiancé. This too is something one could imagine happening today, rather than during or preceding an apocalypse. Perhaps Mullany is trying to warn us with these episodes of familiarity that the end of the world could be around any corner, lurking above or below any party or any sleepless night. Mullany’s apocalypse is on the precipice of the now, though his work does not specify the line that our current reality must cross for the end to begin. Through these fictions, the recognizable repetition of daily life foreshadows the end that is to come. More than the micro-fictions, Mullany’s prose poems take the reader to a more anarchic and despondent time than the familiar present and presumably closer to or after an actual apocalypse. An example in Book I would be “The Love Factory”. This titular place where citizens line up in pairs, waiting to be allowed to enter a factory for a specific purpose is from a reality we could easily imagine, perhaps in a future dystopia, though, rather than today. The first line, “You didn’t just meet someone,” (91) explains the title: love is manufactured in this more chaotic possible future. Another example, subtler than “The Love Factory”, is “Honeymoon”, a prose poem from Book III wherein a man attempts to turn on a transistor radio he has found washed up on the shore. Though “he’d tried it when he found it, before he’d shown it to her” (147), and therefore knows it will not work, he attempts to turn it on again. That he tries anyway speaks for an attempt at hope—the man knows it won’t work, but in despair, he tries it anyway. Perhaps the man has no hope, knows the radio will not turn on, but turns the dial in an effort to appear romantic in front of his new wife. Radios are associated with music, and music is often read as romantic. If the man does it for this reason, this ca be read then as a lack of trust between the newlyweds. This deficit of trust coupled with the readers’ inability to tell the difference between truth and lie—is he truly hopeful for the radio to turn on or is he lying to his wife in his attempt– is a recurrent theme throughout Mullany’s volume. Mullany’s poems are the closest to and sometimes an actual part of a clear apocalypse—not “the” apocalypse, but “an” apocalypse. The difference being that there is more than one outcome, more than one way the world may meet its end. This volume, again, prepares for those possibilities rather than foretells one specific ending. This is reminiscent of the short stories in Matt Bell’s Cataclysm Baby (Mud Luscious Press, 2012) which tells a variety of different ends to the world through the eyes of new parents in each possible future. What makes Mullany’s rendering of the apocalypse different from Bell’s is that the latter’s comes in a number of different forms, with humans encountering beasts and other non-human creatures. Mullany’s version, instead, though also varied, is distinctly human. There is something relatable in the pictures he paints, something easy to imagine, though readers hope far from the near future. If Mullany’s prose poems and micro-fictions sometimes seem like disparate parts with an unclear relationship to the book’s narrative and thematic purpose, the poems help to thread the collection together and without them the prose poems and micro-fictions alone could seem arbitrary and unrelated. They seem like glimpses into moments of tragedy that don’t seem to end. The mirroring of the couple is almost too exact for the reader’s comfort. The doublings often seem to be a reflection from a funhouse mirror, one that intentionally misrepresents, but still doubles. These mirror images even come in triples and more on occasion, as in the next poem, “The Avalanche” that reads “White on white / on white on…” (131) and so on. The line breaks are extremely effective because they work to stagger the parallels presented in a way that dislocates rather than aligns. In Book Three, “The Men on the Beach” is a short poem that has a certain ominous repetition to it, a repetition that is slightly different from the doublings that occur in many of his other poems. “The Men on the Beach” stand “alone or in groups”. Mullany does not have to tell us why these men are scattered. Part of the charm of his apocalypse is that the figures presented within it know why they are where they are and what they are doing there. Readers should accept this, for the motives and movements of the last remaining humans on Earth are supposed to be far from daily existence today. Regardless of whether the men choose to stand with other men or on their own, they all do the same thing, watching “the tide / coming in and going // out” (128), something despite the foreignness of their situation, readers can relate to. The ocean here can symbolize a vast number of things, but something it is always sure to represent is the idea of a cycle, ebb and flow. That these men have nothing left but to stand as the tide repeats encapsulates their despair. This poem is one that utilizes a repeated idea in Mullany’s work—a distinct use of the coordinating conjunction “or”. This word is said to have the power to separate while also joining, and Mullany has mastered the art of this word throughout this collection. A great example of Mullany’s exceptional use of the word “or” can be found in “The Zoo Without Creatures”, where visitors play at being the animals that no longer dwell there. Visitors can “sleep // or pretend to sleep” (115) in the empty cages. Many times the poet’s use of the word “or” is to show the fine line between an act and the miming of that act, between the real and the imposter—though often the “or” confuses the two rather than joins them. This serves to perhaps reveal or hint at prevarication, as in “The Warden’s Wife” who “prayed or thought // about praying” (51). Whether this woman can tell the difference between the two—between thought of prayer and prayer—is unclear in a satisfying way for readers here, who can relate to sometimes acting invested in something, yet not actually fully committing to it. The fact that the wife prays or merely thinks about prayer when her husband is at work, though, complicates the notion. If she is alone, she does not need to act. She has only herself to impress. This uncertainty of self is an example of the human realities and their difficulties that the book showcases, though on the precipice of an apocalypse, rather than the everyday. In a poem titled “The Book That Wouldn’t Burn”, one of the more frustrating yet hopeful poems in the volume, the reader is confronted with a book clearly containing writing “when it was closed” but writing that “disappeared when it // was opened” (156). The frustration of an impossible book like this gives way to a number of possible themes about the importance of obscurity present in many works of literature. However, that there is writing in the book is clearly a more optimistic sign than a complete lack of writing. There are more frustrating poems in Figures for an Apocalypse that depict objects that have become useless, such as “The House Full of Clocks” where “You could open the door, but you could not go in” (94). The clocks are there, but they are inaccessible. “The Statues of Weeping Women” in Book Two further emphasizes the idea of objects detached from but still relics of humanity, perhaps in a more despairing manner than the other two poems mentioned previously: “Along empty highways they // were placed at equal // intervals” (78). If the highways are empty, who is there to take note? When were these statues placed there and by whom? Even that the women are weeping and that humanity would find them essential to erect is a mystery, but if nothing else, the emptiness of the highways lets a reader know there is no happy solution. While the volume is often subtlety dark at times, it also is quite obvious at others. For example, the four horses of the apocalypse make a few appearances. Perhaps most notably in Book III in a short poem that mentions the death of both “the first horse” and “the second horse” (168). It is hard to read these horses as anything but those “of the apocalypse” especially considering the title’s namesake—Merton, who penned the original Figures for an the Apocalypse was a Christian mystic, and his title looks forward to the day when God would step down from heaven to walk the Earth again. In Mullany’s “The Two Horses”, a reader is left wondering not only what has become of the third and forth horse, but also how the first two died. If it’s a sign that the apocalypse is nearing an end (which makes sense since the scene is placed towards the end of the volume) the following piece, a prose poem about a woman at a train station who watches trains pass her all day rather than getting onto the normal one she takes to work, does not follow that narrative of closure. This speaks to the idea that humans are constantly aware of cycles, seeing the loop of everything, and more specifically endings as new beginnings. When reading about the end of the world, there is only the end. The reader knows what happens post-apocalypse: the world is over. If we are to be discussing it, to be figuring on it, to be providing figures for it, it must not have arrived yet. There must be something we can do to prevent it or at the very least, prepare our selves for it. We must be the hope that is lacking from many of the characters and scenarios and moments presented in Mullany’s Figures for an Apocalypse, the hope for humanity that lurks in some but not all of the poems, prose poems, and narrative prose of this volume. This entry was posted in Book Reviews and tagged book reviews, Edward Mullany, Figures for an Apocalypse, Kimberly Ann Southwick, Publishing Genius, Sundog Lit, Sundog Lit Blog. Bookmark the permalink.